IP Ownership. The Gordon and Betty Moore Foundation (hereafter, The Foundation) and University of North Carolina Wilmington (hereafter, UNCW) agree that any intellectual property that UNCW, and any of its agents, employees, contractors, or subgrantees creates by the performance of this Grant Agreement (the "Grant Works"), shall be owned according to UNCW's standard IP practices or policies. 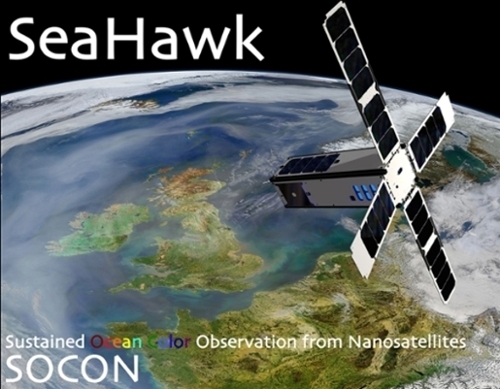 enables such individual or organization to replicate the HawkEye Ocean Color Sensor and Seahawk CubeSat on a royalty-free, non-exclusive, worldwide, perpetual basis without restriction as to use. These conditions are referred to collectively as the "IP and Knowledge Sharing Principles." With respect to the Seahawk CubeSat, UNCW will ensure that Clyde Space provides a system level design document that outlines the standard commercial off-the-shelf components used and how they are interfaced electrically and mechanically, including the part numbers and user manuals for the commercial off-the-shelf component subsystems. UNCW will further ensure that Clyde Space provides full design information for any electronic, software or mechanical element that is developed specifically for the Seahawk CubeSat. UNCW will ensure the system level design document, part numbers, custom design information, and any other information or rights needed to satisfy the IP and Knowledge Sharing Principles will be made available via the principal investigator's website for a period of three years (6/1/2016-5/30/2019).